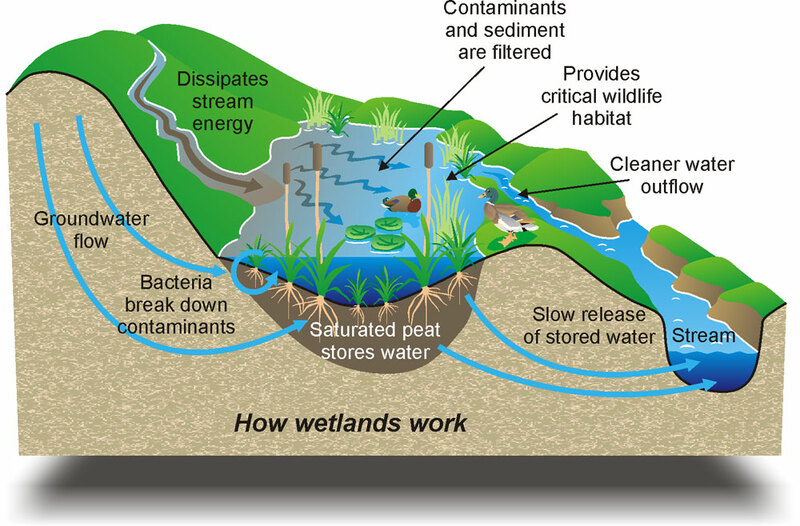 Wetlands are areas where water covers the soil, or is present either at or near the surface of the soil all year or for varying periods of time during the year, including during the growing season. Water saturation (hydrology) largely determines how the soil develops and the types of plant and animal communities living in and on the soil. Wetlands may support both aquatic and terrestrial species. The prolonged presence of water creates conditions that favor the growth of specially adapted plants (hydrophytes) and promote the development of characteristic wetland (hydric) soils. The main wetland types include swamps, marshes, bogs, and fens. A swamp is a wetland that is forested. Many swamps occur along large rivers where they are critically dependent upon natural water level fluctuations. A marsh is a wetland that is dominated by herbaceous rather than woody plant species. Marshes can often be found at the edges of lakes and streams, where they form a transition between the aquatic and terrestrial ecosystems. A bog is a wetland that accumulates peat, a deposit of dead plant material—often mosses, and in a majority of cases, sphagnum moss. Fens are usually fed by mineral-rich surface water or groundwater. They are characterised by their water chemistry, which is pH neutral or alkaline, with relatively high dissolved mineral levels but few other plant nutrients. They are usually dominated by grasses and sedges, and typically have brown mosses in general including Scorpidium or Drepanocladus. 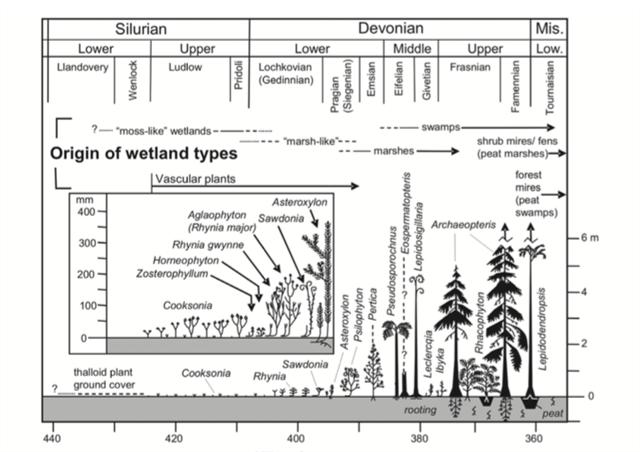 Geology plays an important role in the wetland development and the characteristics listed above. Water accumulates in areas where it cannot penetrate the earth below. Some rocks, such as granite, shale and slate are naturally impervious to water . On the other hand, porous rocks can become impermeable if their pores become filled with fine particles from soil or sediments. The landscape also plays a large role in the ability of water to accumulate in an area. Topogenous water movement is predominantly vertical and overland. resulting in water ponding in depressions such as valleys, basins and floodplains. Basically a stream, feeding a small pond or marsh with no outlet. Soligenous water movement is predominantly lateral through the soil or discharging from the rock, such as spring. Basically the water is bubbling or soaking up out of the ground. Flood Plain A location where the floods, rains or high waters form a wetland. Areas near a stream. Geology also plays a role in the chemistry of the water that flows through a wetland since the water is affected by the rocks and sediments in the area. The water that flows through a wetland is the source of nutrient elements for the plants and therefore is ultimately the basis of mineral nutrition for all inhabitants of wetlands. To earn credit for this Earthcache, please email me with the answers to these questions. Please do not include answers in your visit log. Name at least one important function of a wetland. Describe the source of water for this wetland area as witnessed at GZ. Does it come from floods, and streams? Is there an outlet or does it appear to be a spring bubbling up in the area? Based on your previous conclusions would you say it is Topogenious or Soligenous? Admission There is a $5 per car fee to enter the Denver Botanic Gardens. The hours of operation are from 9am - 5pm. Please respect the property owners who allowed us to place these caches and only hunt for these caches during hours of operation.